Dean Shiels made his debut as a substitute just hours after his loan move from Doncaster was completed. 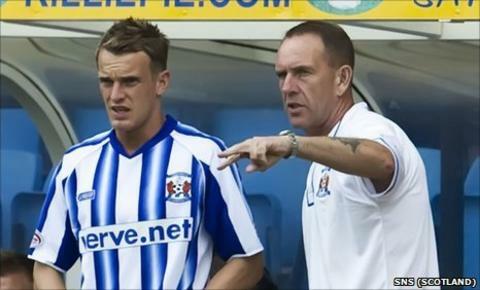 Kilmarnock's new signing Dean Shiels says being managed by his dad won't be an issue. The 26-year-old who joined from Doncaster on loan had the chance to score on his debut against Motherwell, just hours after completing the move. "When you go on the pitch all the talk of being the manager's son goes out of your head," he told BBC Scotland. "Once you're out there playing, he's not my dad, he's my boss. I'm out to do a job for him, the team, the fans." The pair have worked together in the Northern Ireland youth set-up but never at club level and Shiels junior showed some good touches after coming on in the 73rd minute. "Anyone who knows my father will know he will not treat me any different to anyone else, and I wouldn't want it any other way," the former Hibs player said. "You can see the way he wants to play. I've been brought up at Arsenal, at Hibs initially under Tony Mowbray and at Doncaster, and that football suits the way I play and I think it gets the best out of me." Sheils junior was a regular at Doncaster but wanted to return to Scotland for family reasons. "I had a lot of reasons to come back. My wife's from Scotland so that was a big pull. "I enjoyed my time at Doncaster and I'm still a Doncaster player but I want to help Kilmarnock as much as I can." "I don't have any thoughts on what will happen in the long term. "It's all been so rushed that I've barely had any sleep over the last couple of days. "Now my first game's out of the way hopefully I can concentrate on getting my head settled."